This very pretty little bird is Zipper. She was found as a stray in Santa Clara. Something took a few of her tail feathers and scraped a place on her cheek, but she made it to safety. She stayed in an animal shelter for a little while and then she came to Mickaboo. She is a beautiful little albino budgie, white as snow. She`s still kind of nervous around people, but I know she would be very happy to join a family that has budgies for her to make friends with. 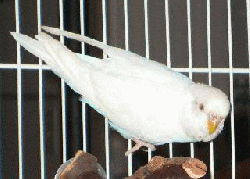 Like all budgies, she is a flock bird and will do well with budgie friends.